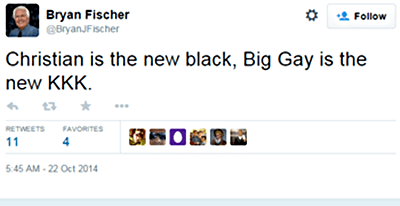 American Family Association Hate Group's Bryan Fischer: "Christian is the NEW Black, Big Gay is the NEW KKK." How many “Christians” have been lynched? How many “Christians” have been beaten, tied to fences in Wyoming and left to die in? How many “Christians” have been attacked in the Dallas Airport because “This is America”? A REAL Christian would never spout such lies and hateful rhetoric. The NEW KKK is the OLD KKK. White straight pathetic inbreed losers. Perhaps Bryan should ask his good friend Tony Perkins of the FRC about that. Besides we have better things to do in the sheets. Prop 8 Supreme Court Transcript and Audio Recording Released – Read, Listen HERE!